Why study Mining Engineering in Australia? In short, because you would be studying in one of the world’s leading mining nations with significant opportunities for work placements in almost all types of mining by companies ranging from small to medium to the world’s largest. Your degree would also comprise a curriculum internationally acknowledged as one of the best in the world, actively informed by world-best industry practice and supported by the nation’s mining companies. 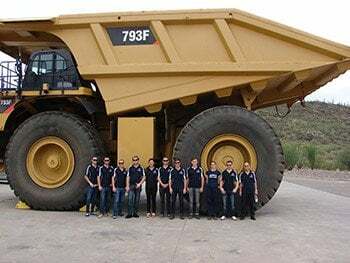 All undergraduate Mining Engineering degrees in Australia are of four years duration and are offered at the University of Adelaide, Curtin University, the University of New South Wales, the University of Queensland, the University of Ballarat, the University of Wollongong and Monash University. In addition, the University of Western Australia offers a three-year Bachelor degree followed by a two-year Master of Professional Engineering specialising in Mining Engineering; the Bachelor degree may be in any of Science, Commerce, Arts, or Design but must include a major in engineering science. The Institution of Engineers Australia professionally accredits all four-year Mining Engineering degree programmes offered in Australia. Accreditation ensures that these programmes meet national and international benchmarks and that other countries, including Canada, Hong Kong, New Zealand, South Africa, the United Kingdom and the USA, recognise the degree qualifications. The importance of this for graduates is that their degrees are portable for employment throughout most of the world. Mining Education Australia (MEA) is an unincorporated joint venture of the University of Adelaide, Curtin University, the University of New South Wales and the University of Queensland to deliver a common national mining curriculum for the Bachelor degree in Mining Engineering. In addition to a common curriculum, courses are taught collaboratively by academics from the four member universities and students interact in academic and social activities with their peers from the partner universities. Having four universities contribute to curriculum development and teaching significantly increases the quality of the MEA degree and has contributed to its international standing and reputation. MEA is funded and supported by the Minerals Council of Australia (MCA), which comprises 52 member companies (mining and mining services companies) and 44 associate member companies. MCA member companies account for more than 85% of Australia’s annual mineral production and more than 90% of the nation’s mineral export earnings. MEA produces around 85% of Australia’s Mining Engineering graduates; the total number of MEA graduates in 2012 was 200 and similar numbers of graduates are expected over the next two to three years. The latest published Australian employment statistics for graduates available for employment are those for the year ended 31st December 2012. For Mining Engineering graduates, 93.9% were in full-time employment, 5.1% were seeking full-time employment and not working, and 1.0% were seeking full-time employment and were working part-time. These are the highest rates of graduate employment for all Engineering disciplines and, together with Medicine, the highest rate of graduate employment for any discipline. This article has been written by Prof. Peter Dowd, Executive Director of Mining Education Australia.